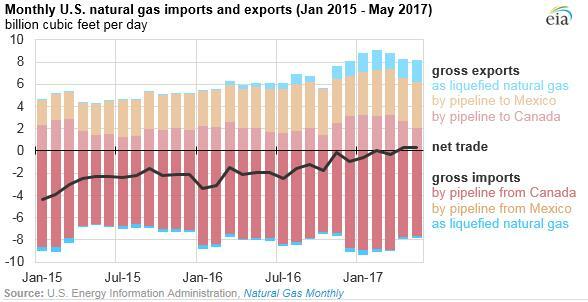 The U.S. Energy Information Administration (EIA) released an analysis this week that the United States exported more natural gas than it imported in three of the first five months of 2017. These data show that with the continued increase in domestic natural gas production – thanks to hydraulic fracturing and horizontal drilling – the United States could soon be on its way to becoming a consistent net exporter of natural gas. Much of the growth in natural gas production is happening right here in Texas, specifically in the Permian Basin and Eagle Ford Shale. The Permian is currently the second largest natural gas producing shale basin in the United States, with the Eagle Ford standing as the fourth largest. Combined, these two regions produced roughly 14.7 billion cubic feet of natural gas per day (Bcf/d) in July, with that number expected to increase to over 15 Bcf/d in August, according to EIA’s July 2017 Drilling Productivity Report. Moreover, Texas as a whole is the largest producer of natural gas in the United States. According to EIA data, Texas accounted for almost 21.5 Bcf/d in natural gas production in May – almost a quarter of all U.S. natural gas production that month. 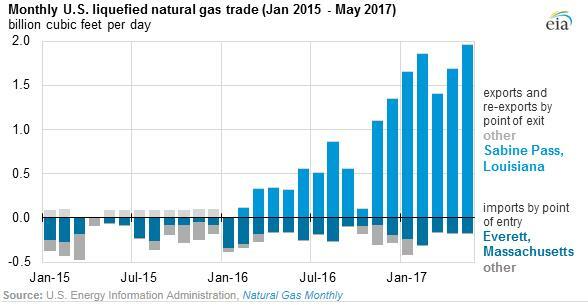 According to EIA, natural gas exports to Mexico from the United States have increased significantly in the first five months of 2017, averaging 4.04 Bcf/d, up from an average of 3.78 Bcf/d in 2016. Further, U.S. natural gas exports (by pipeline) to Mexico have increased over 350 percent since 2005, with more pipeline projects planned. To reach other trading partners around the world, the United States is also expanding its capacity to export liquefied natural gas (LNG), which allows for the transport of natural gas over much longer distances. As the EIA report shows, LNG exports grew from almost zero at the beginning of 2016, to almost two Bcf/d in May 2017. Currently, there is only one facility in the U.S. exporting LNG, but in Texas alone seven LNG export projects are planned or currently under construction to come online in the next several years. Development of these Texas facilities is expected to generate about $145 billion in economic impact nationwide, as well as 70,000 Texas jobs. Additionally, one study estimates that LNG exports will account for about $31.4 billion of new income in Texas by 2035. The increased production of natural gas in the United States has resulted in improved energy security by decreasing American reliance on imported foreign gas. More importantly, this increase in production has generated a substantial amount of economic growth within Texas and all across the United States, allowing for greater trade with our neighbor to the south and spurring billions of dollars in LNG development.